Travel by Ferry from Bangkok to Koh Chang, Koh Mak, Koh Kood, Pattaya, and Trat! 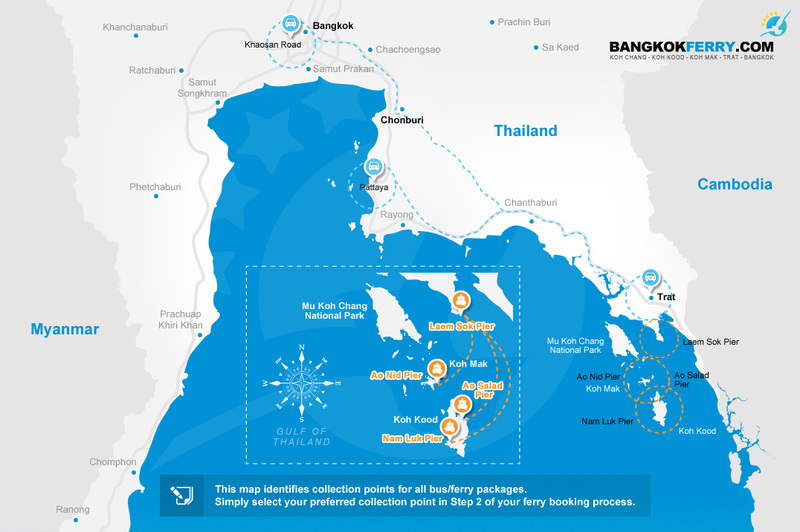 Connecting the World to Thailand's Amazing Places: Bangkok Ferry now provides you with bus/ferry trips to some amazing islands. Choose your ferry from Bangkok to Koh Chang, take a ferry from Pattaya to Koh Kood, or visit Koh Mak, Trat, and more! Our BangkokFerry Mission: Connecting the world to some of Thailand's most amazing places by ferry and bus. This mission drives all of our activities everything we do, we are constantly working to provide you with best quality ferries at the lowest prices possible. You can reach us easily by telephone, customer service chat or by email - our expert customer service team is ready to connect you to islands dreams are made of! The Thailand Ferry Experience: Whether you are travelling from Bangkok to Koh Chang, Pattaya to Koh Kood or to the other beautiful islands such as Koh Mak be assured of awesome experiences on quality checked, modern and safe ferry boats with onboard services, food and drink, and incredible island views and seascapes. Bangkok Ferry Customer Service: We're always making sure of the quality, service, reliability, and safety of each ferry operator and their ferry fleet. Our goal is to bring you confidence from the time you book your ferry trip to the time to step off the ferry at your chosen destination. We know the ferry operators so well. Because of this, we can offer you the fastest booking confirmation, quick e-tickets, and fast notifications of ferry cancelations or schedule changes. Do You Have a Question? : "Which ferry is best? 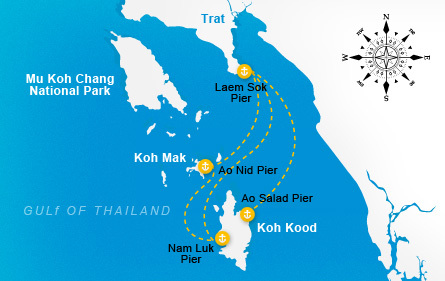 ", "How do I get to Koh Chang? ", "How do I get from my hotel in Bangkok to the Ferry Pier?" We are experienced in giving quick answers to so many questions. Simply contact us directly or visit our FAQ page and your questions will be answered. Go On, Visit the Islands! Why limit your vacation experience to the cities when the islands are so easy to travel to! Bangkok Ferry has made it really easy to catch a ferry from Bangkok to Koh Chang, Pattaya to Koh Kood, Koh Mak, and all the other ferry trips in between. Each ferry is safe and modern, each ferry runs a daily service. Sit in the sun up on deck or inside the boat on comfortable chairs, life's a breeze on the seas - it's not like being on a plane, on a ferry you can move wherever you please! On the Day of Your Travel: Print your BangkokFerry e-ticket. You must show it to the ferry pier staff. The boat staff will simply take your e-ticket and put a destination sticker on you. Then you're good to go, so enjoy your trip. Don't forget to check our ferry Travel Tips so that you're well prepared.